Stop Codon Insertion by Fast & Steep PCR Site-Directed Mutagenesis and Seamless Assembly (paid service). The researcher located at McGill University in Montreal contacted us to introduce Stop codons at specific sites using Site-Directed Mutagenesis. Each Stop codon has to replace a specific codon within the gene of interest (GOI). The GOI which is already cloned into a mammalian expression vector. At Civic Bio, we rarely use a site-directed mutagenesis strategy whcih consists in amplifying the whole vector (read PCR Success Story #16 for the difference between 2 workflows). We guarantee our work and also guarantee that no extra mutation will be introduced into the backbone vector. To protect the research and privacy of the customer who paid for our Design, Single Site- and MultiSite-Directed Mutagenesis Services, the name of the gene of interest and researcher are held confidential. In addition, we have developped a new PCR setup and cycling protocol that allows for 100% integration of all primers in only 5 cycles of PCR, which can be applied to Site-Directed Mutagenesis. We will publish this new protocol in a near future. Combined with Site-Directed Mutagenesis and pEASY Cloning by Seamless Assembly, this protocol also allows for multisite-directed mutagenesis. The gene of interest (GOI) is over 2 kb long, 38% GC-rich, has many nucleotide repetitions and the whole plasmid is over 8 kb long. To complicate this project, no single-cut restriction sites are available anywhere either at the beginning, the middle or the end of the GOI. introduction of a unique cutting site (Kpn I) adjacent to the original Stop codon. design and creation of Stop codon mutants by Fast & Steep PCR* Site-Directed Mutagenesis and pEASY Seamless Assembly or restriction enzyme/T4 ligase cloning. *Fast & Steep PCR : this specific methodology will be detailed in a near future. 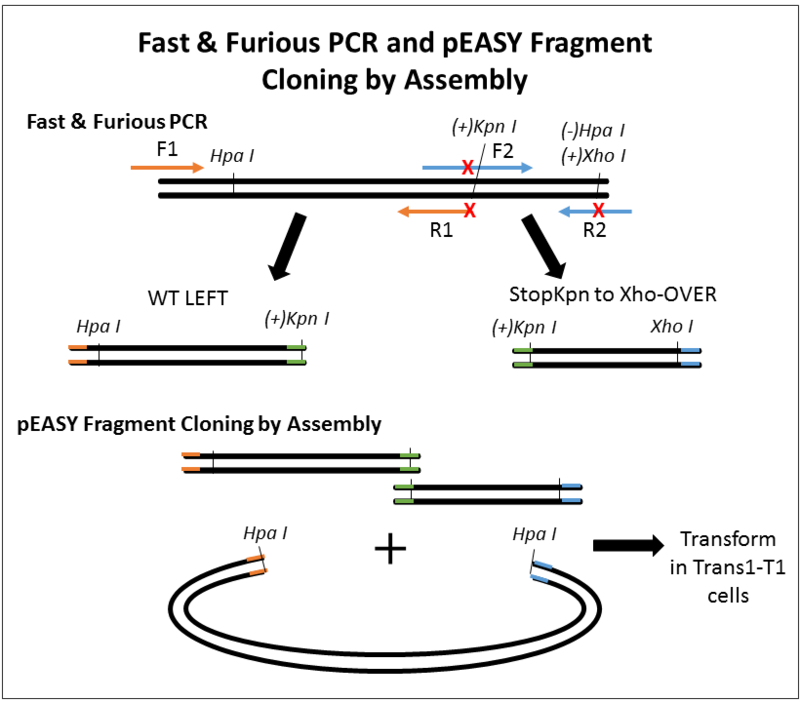 The important thing to know is that the 5 to 8-cycle PCR step takes approximately 15 min for 1 kb fragments and nearly all primers are consumed during this short PCR. 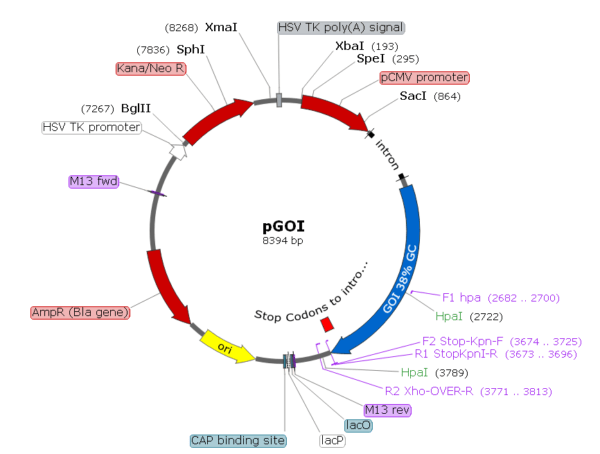 The Original WT Plasmid Map does not have Unique Restriction Enzyme sites anywhere near the desired Stop Codon Insertion sites. To introduce the desired stop codons without performing PCR amplification of the whole pGOI vector, we needed unique restriction sites withing approximately 1 kb of the mutation sites inorder to perform Site-Directed Mutagenesis. The Hpa I sites located withing the GOI and after the original WT Stop codon was our only option. However, Hpa I creates blunt ends and won’t allow for directional cloning using restriction enzymes. Elimination of 1 out of 2 sites of a dual-cut restriction enzyme (Hpa I) and addition of a unique cutter (Xho I) and addition of a Kpn I site next to the stop codon. The first step consisted in digesting pGOI with Hpa I and gel extraction of the largest band (backbone) using the FavorPrep GEL/PCR Purification Kit. StopKpn to Xho-OVER: F2 Stop-Kpn (includes the Kpn I site 3′ to the WT stop codon) + R2 Xho-OVER-R (removes Hpa I, adds Xho I and overlaps the vector). Gel extraction was performed using the FavorPrep GEL/PCR Purification Kit. IMPORTANT NOTE, the PCR products were not digested with DMT enzyme (Dpn I) because fragments of similar size to the bands of interest are generated. After gel quantification of the backbone (Hpa I-digested), Stop WT LEFT and StopKpn to Xho-OVER fragments, adequate molar ratios of each fragments were mixed with the pEASY®-Uni Seamless Cloning Assembly mix and incubated 30 min at 37°C. One (1) ul of the assembly reaction was transformed into 50 ul of Trans1-T1 Phage Resistant Chemically Competent Cells and plated on LB-agar Ampicillin plates. 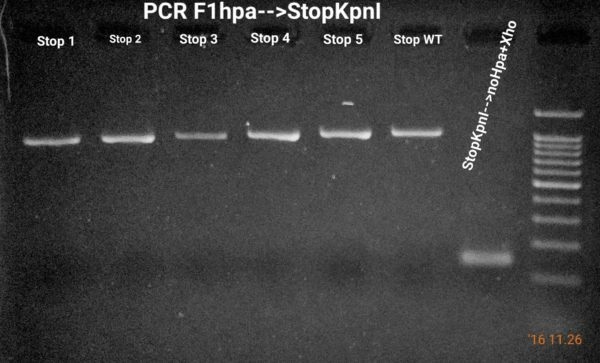 To generate the Stop mutants (Stop 1 to 5), we performed Fast & Steep PCR using Stop WT-KX as template, KD Plus, the F1 Hpa forward primer and Stop 1/2/3/4/5-Kpn reverse primers and performed band purification using the FavorPrep GEL/PCR Purification Kit. 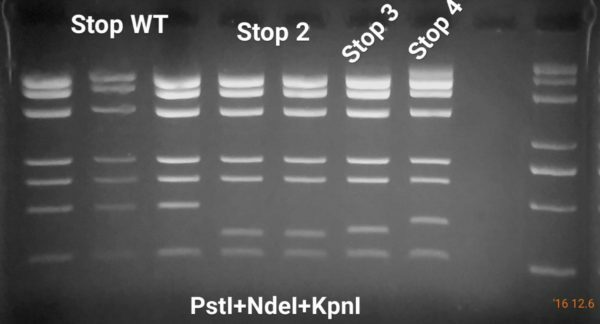 Secondly, the ”RIGHT” fragment StopKpn to XhoOVER had to be digested with KpnI and purified directly using the FavorPrep GEL/PCR Purification Kit. The backbone (Hpa I-digested), Stop 1/2/3/4/5 LEFT and Kpn I-digested StopKpn to Xho-OVER fragments were mixed in adequate molar ratios with the pEASY®-Uni Seamless Cloning Assembly mix and incubated 30 min at 37°C. One (1 ul) of the assembly reaction was transformed into 50 ul of Trans1-T1 Phage Resistant Chemically Competent Cells and plated on LB-agar Ampicillin plates. Clones were screened by colony PCR with EasyTaq before performing plasmid DNA miniprep extraction using the EasyPure Plasmid DNA Miniprep Kit. Plasmid minipreps were sent out for sequencing at La Plateforme de Séquençage du CHUL in Quebec City. Want us to Perform and Design your Cloning Project too? Put us in charge !